In the Russian Far East, mixed and deciduous forests occur in the Khabarovsk region (in the Amur basin, approximately between 51°N and 49°N) and in the Maritime Province. The southern Far East largely escaped the Quaternary glaciations which allowed many Paleogene species to survive. The long evolution of forest biomes has resulted in a complex and unusual floristic composition. More ancient species are better preserved in the Far East than in the European or North American forests (Ching, 1991). In contrast to the forests of China and Japan, the forest biomes of the Russian Pacific have experienced much lower anthropogenic impacts. At present, they represent a mixture of boreal and subtropical species and although the forests of the Far East contain many Siberian species, the Far Eastern forests are very different from those of Siberia. Contemporary environmental conditions in the region are extremely complex. Topography is strongly dissected, providing a variety of habitats. In the middle and lower course of the Amur, the plain is crossed by ridges up to 800 m high, although both the Amur and its tributary, the Ussuri, also drain vast lowlands. The southernmost areas are occupied by the Ussuri and the Khanka plains. Forests of the southern Far East develop mainly on brown forest soils where fertility is comparable with that of chernozems (although in many cases they are podzolized). The region has a distinctive monsoon climate with cold, dry winters and rainy seasons in late summer-early autumn. In Vladivostok (43°06'N, 131°50'E), the mean January temperature is as low as -15°C. The depth of snow cover averages 20 cm. In the extremely low temperatures a relatively thin snow cover does not provide sufficient insulation and soils freeze through to a depth of approximately 120 cm. Summers are quite warm and in general the region receives enough heat and moisture to support mixed and deciduous forests. In Vladivostok, the mean July temperature is 17.3°C. The Amur valley annually receives about 500-550 mm of precipitation and Vladivostok receives 788 mm. However, the monsoonal influx of marine air differs greatly between spring-early summer and late summer-early autumn. Between 50 per cent and 70 per cent of annual rainfall occurs between July and September (when floods and waterlogging are common). In contrast, spring and the early summer, when plants experience their greatest growth, can experience drought. Cold winters and frequent droughts in early summer put strong selection pressures on plants. The Far Eastern forests are distinguished by very high biodiversity. In the mixed forests developing in the Amur lowland, a single association may have up to 40 species of trees and shrubs and the total number of tree species reaches 70. Forests have a typical polydominant and multitier structure. Some communities have 13-14 tiers of trees and shrubs. It is often difficult to distinguish between the tiers, and to the observer on the ground the forest appears as a single, uninterrupted green realm (Shumilova, 1962). Across the region, Pinus koraiensis dominates and Abies nephrolepis, A. holophylla, Picea koraiensis, and P. ajanensis are most common among conifers. Tilia amurensis, Quercus mongolica, Acer mono, A. mandshuricum, Betula dahurica, B. costata, Carpinus costata, and Kalopanax septemlobus are the most typical deciduous species. The undergrowth consists of Acer spp., Primus maximoviczii, P. maackii, and Ligustrina amurensis. In the herbaceous cover, ferns and Aconitum raddeanum are common. Forests contain a variety of woody vines, including Vitis amurensis, Actinidia kolomikta, and Schisandra chinensis. 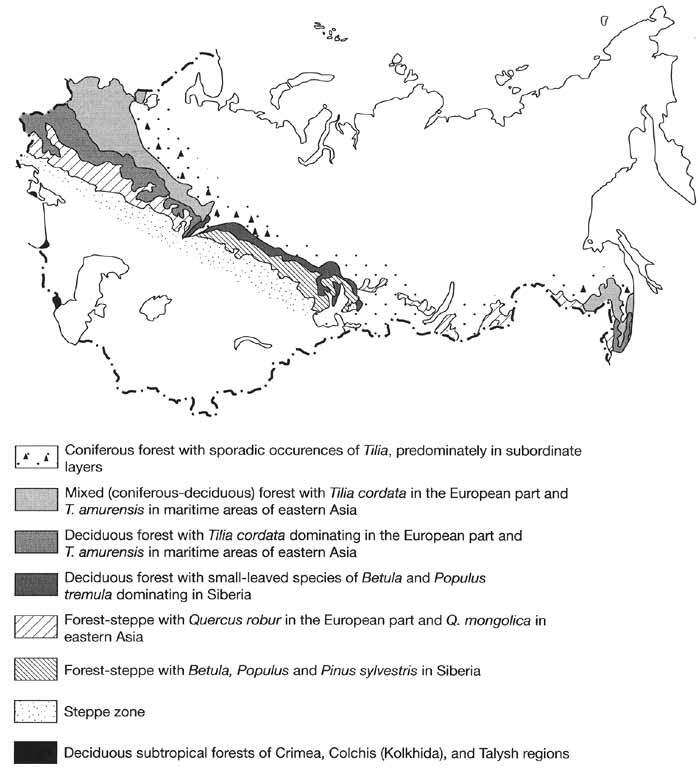 On the plains of the Cis-Amur region, Quercus mongolica and Tilia amurensis dominate with the participation of Larix gmelinii (also known as L. dahurica), Betula platy-phylla, B. costata, Ulmus scabra, and Prunus maackii. Fraxinus mandshurica, Acer ginnala, Euonymus pauciflorus, and Corylus heterophylla are also common. The undergrowth includes Lespedeza bicolor (a shrub that is willingly eaten by cattle) and Rhododendron dahuricum. The herbaceous cover (Vicia amurensis, Geranium maximoviczii, Veronica offlcinalis) is characterized by high diversity but is not always dense. On the southern slopes of the Bureya Ridge, Quercus forests with complex undergrowth (Rhododendron, Corylus, Spiraea ussuriensis, and Euonymus pauciflorus) are widespread. The herbaceous cover consists of Artemisia gmelinii, Convallaria, and Carex. The admixture of Larix gmelinii occurs almost everywhere in the oak forest of the Cis-Amur region and, therefore, it is difficult to distinguish between deciduous and mixed forests. Many Quercus forests display elements of steppe vegetation. The herbaceous cover in such forests consists of Artemisia gmelinii, Iris uniflora, Coeleria gracilis, Tanacetum ssp., and other xerophytes. These are likely to be relics of the middle-Holocene thermal maximum, but the present climate with alternating wet and dry periods may also favour their development. Further south, in the forests of the Ussuri plain, Manchurian species become more widespread and coniferous trees dissappear from the lowlands. The most typical tree species are Ulmus pumila, Phellodendron amurense, Juglans mandshurica, Ligustrina amurensis, Prunus maackii, P. ussuriensis, and Malus mandshurica. On hilly watersheds stands of Quercus mongolica develop with admixture of Betula platyphylla, B. dahurica, and Populus tremula. Slopes of the Sikhote-Alin are covered by mixed forests composed of Pinus koraiensis, Picea koraiensis, Abies nephrolepis, Tilia amurensis, Acer, Quercus, Betula, Fraxinus, and Ulmus glabra with variegated undergrowth and woody vines. In the south of the Ussuri plain, the diversity of trees and shrubs increases sharply up to 150 species. Mixed forests, dominated by Quercus and in the undergrowth by Corylus, develop on uplands. These forests also contain Pinus koraiensis, Abies holophylla, Picea ajanensis, Juglans mandshurica, Betula costata, Tilia amurensis, Acer amurensis, and numerous shrubs and woody vines and are often referred to as Vine forests'. Among the latter, Actinidia kolomikta, which develops climbing roots of up to 20 cm in diameter, is common (Shumilova, 1962). Azonal habitats are represented mainly by vegetated wetlands and floodplain meadows (the so-called 'Amur prairies') dominated by tall herbs, mainly Calamagrostis langsdorffii. Vegetated wetlands develop predominantly in the lower course of the Amur. Three major types occur: Sphagnum swamps with Betula; Sphagnum bogs with low shrubs and herbs, such as Vaccinium, Cassandra, and Carex; and swamped forests dominated by Larix with Ledum, Carex, and Sphagnum. Specific to the same region are swamped forests with Alnus glutinosa and Betula and the water-streamed swamps (so-called also) in which the thickness of the peat horizon exceeds 2 m. The primary birch forests (so-called bel) with Betula pubescens occur in the swamped sites on lowlands. In stream valleys, dense, almost impenetrable forests (termed urema) often develop. Among water plant relics, Nelumbo nucifera, Brasenia purpurea, Trapa natans, and Euryale ferox are the most well-known.